Kidde Dual-mode strobe light is used with a smoke, heat or carbon monoxide alarm that provides a bright visual signal to warn smoke, heat or CO hazard. It has a tamper-resistant pin that helps to deter the thief and tampering. This strobe light notifies hearing impaired individuals of impending danger. 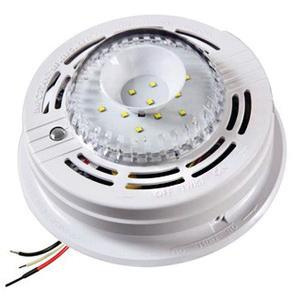 When the light is triggered by a smoke alarm or heat alarm, it will produce a steady flash warning. Plug-in connectors provide the electrical connections. Strobe light is UL listed, ANSI certified, ADA compliant and meets NFPA standards.